I have a 22' Harbercraft landing craft that has had seen some very hard use. It is a fully painted hull and I think it is a 1996 vintage. Close inspection has revealed that the chines and transom outside edges have hairline cracks along the joints of the hull. This came to my attention from pulling the plug at the launch ramp after fishing on a sunny day. They are all straight and not tears in the metal but I suspect that the grinding finishing prep for the original paint ground down the exterior welds to a very thin layer. I am planning on just surface grinding away the paint maybe 2" away from each side of the weld and re-welding the joints, all from the exterior. The deck is welded on so I can't undo it to re-weld the interior of the joints. Am I going about this correctly? The whole hull is 3/16"
Sobie2, not enough info to really give a well informed reply. Pictures are worth thousands of words- so when the paint is stripped back (?) snap some images and post up-maybe we'll be able to give an informed opinion? Do you know the actual cross section, alloy of parent & filler? Weld prep? weld sequence and back chipping when built? Too much in the air/variables/unknown to opine; except in theory. Yes, if welds begin to crack -replacing those welds if a good idea! It is not generally considered good practice to remove MIG welds' head or crown unless... the weld prep was such that enough cross section is left. Not knowing how the boat is experiencing loading to flex these joints ? AND the fact that some boats' engines have a standing vibration in the entire boat as different harmonic frequencies- that are about impossible to predict- the cause of the weld failure is more important now than just the fix of some cracks. Well my phone camera lens is cracked. I have begun stripping the paint and I can see that the interior welds are still holding the boat together. I'll try to see if I can get a good shot and I'll post it. 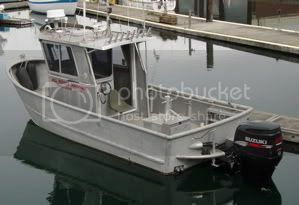 It could be that the boat was built and the exterior welds were ground down and body filler was used. The boat was fully painted. Harbercraft, now Kingfisher, fully paints their boats. The paint has held up well for the most part. I can't find anywhere on the boat the grade of aluminum used to build it but I am going to use filler wire on my spool gun of 5356. Regarding finishing, I have been stripping the well bonded paint with a grinding pad that has 80grit sandpaper, then using a grinding pad with the brown scotchbrite pad. But the pattern it leaves is less than desirable. I'd like the project to end up with a uniform factory like finish so I am thinking about buying one of those air powered straight line sanders. I don't know if I can buy a scotchbrite pad for it, or maybe I should be using some particular grit of sandpaper to create the finish. I'd like it to look like a satin and not mirrored. Then I'll sharkhide it or something.